At only £150 you can have you limited edition, sterling silver Diamond Jubilee Caddy from Harrods! And it is indeed very limited as there are only 60 available. 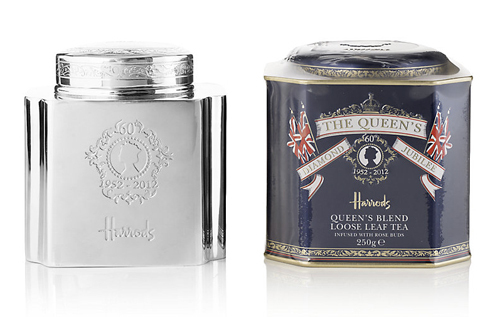 The caddy features a Queen engraving and harrods logo, it is a lovely classic yet modern, stylish design. You will also get another caddy with the Queen’s Blend Tea infused with rose buds. Personally I love it if I had £150 to spare, a brilliant collectors item. Unfortunately there is no details about the tea itself, but one can safely assume that it’s a blend of black teas – very English. 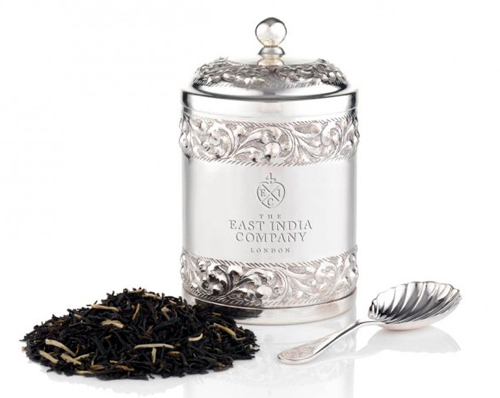 Our next candidate is also a silver plated caddy but at a slightly more affordable £75 from The East India Company. This offering is very interesting because the tea comes from a Sri Lankan tea bush planted in 1954 by Prince Philip, which means drinking true Royal goods. The caddy is handcrafted in a more more classic and ornamental style then the previous Harrods one. This is a black tea from Pedro Estate, something you can typically enjoy in the afternoon. Also a limited edition – 500 available, and you also get a spoon with it. Harney and Sons always comes up with blends with a twist and so they have succeeded this time as well. 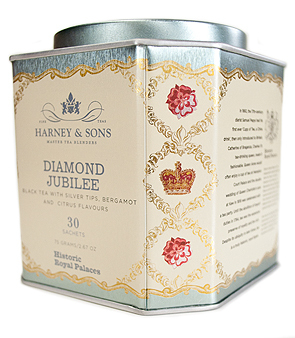 The special blend to commemorate the Diamond Jubilee is a black Earl Grey with silver tips, but as well as bergamot is also has grapefruit essence. Not crazy about the caddy personally, but it is good value for money. You can get the caddy with 30 sachets for $12, but the blend is also available as a loose leaf. This is the only blend I have tried from all the Jubilee teas. It is a black tea blend of Indian Assam and Chinese Yunnan, a typical robust English tea, a bit coarse in flavor. The caddy is a more playful take on the whole Jubilee thing, nevertheless it’s cute. 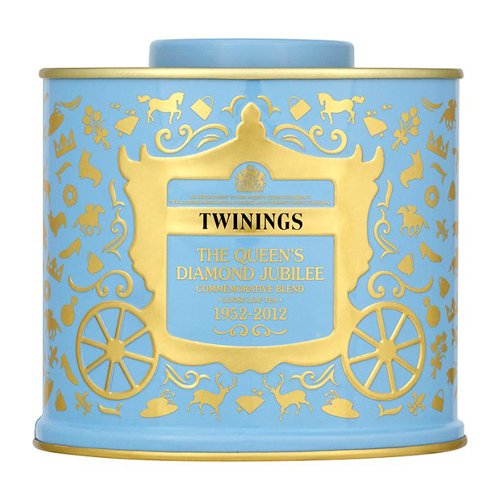 Available as loose leaf in three caddy colors – blue, green and pink for £6 at Twinings, also as tea bags. If you crave some official Royal Family merch this is it. 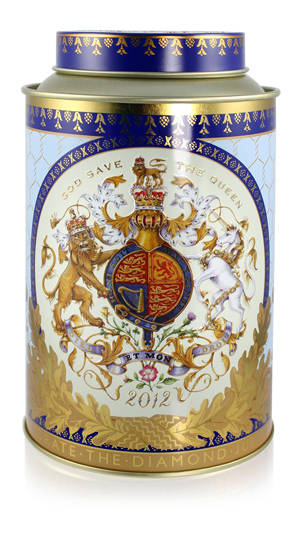 From the Royal Collection Shop you can get this Diamond Jubilee Caddy for £8.95. It is a beautiful, embossed tin containing 50 tea back with, presuming, black tea. 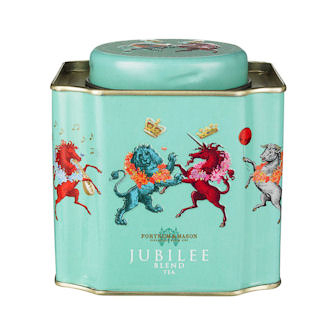 Fortnum & Mason is also offering a Jubilee range, including a black tea blend from India, Ceylon and China. Caddy in classic Fortnum & Mason colors with design specially commissioned for the occasion. It can be yours for £15. Having covered the (I think) majority of the Diamond Jubilee teas out there, there is one last item, although it is not a tea, it is worth a mention. 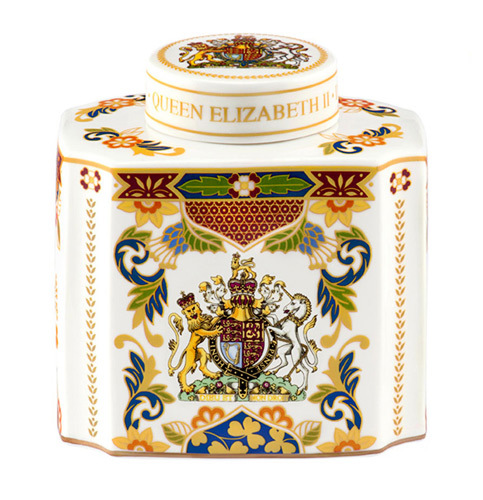 At a hefty £150 Royal Worcester is offering a fine bone china tea caddy that celebrates the Jubilee. As the website points out it is a must have for serious collectors, available in a limited number of 1000. It’s probably hard to miss, because it feels like it has been all over the place, but Twinings has recently released a new ad featuring a cover of The Calling song ‘Wherever You Will Go’. The advert is currently aired on UK television and it’s quite refreshing and unusual – a daring move on the company’s part. Finally they got in some talented illustrators and animators to create this visually beautiful ‘art-film’. Hopefully we will get more of this in the future. No, it’s not a tobacco-flavored tea blend. 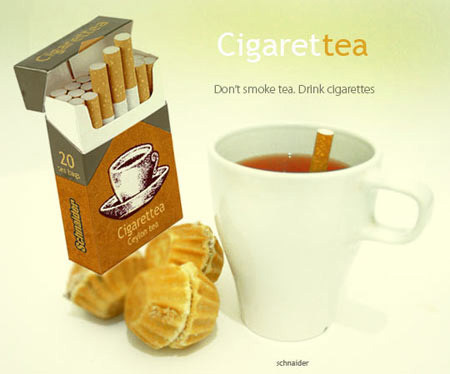 Cigarettea is a concept design developed by Anton Schnaider, that marries the healthy and unhealthy lifestyle. Initially it looks just like any pack of cigarettes, however the usually harmful ‘smokes’ are filled with tea leaves and when dipped in a cup they infuse the water. The filter at the end makes the ‘tea bag’ float. And so you end up with a somewhat unattractive view of a cigarette swimming around in your cup, but just imagine people’s reaction. Smoking has never been so cool, at least not since the invention of chocolate cigarette. But I highly doubt this would be a great substitute for smokers to quit. Very dramatic and very funny – the adverts for Rare Tea Co. Royal Air Force Blend. “Not a load of dust stuffed into a bag” and indeed Britain desperately needs de-bagging, not to mention the whole milk and sugar ritual. Origami tea – an amazing concept by Russian designer Natalia Ponomareva. 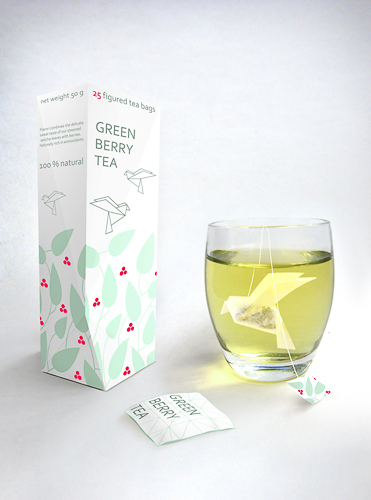 A very simplistic design of package and tea bags inspired by origami folding. I dont’ doubt that this would be a huge hit with all tea lovers out there. Let’s hope it goes into production! Callum Kenny, a design student, has created a tea set which allows tea drinkers to brew a perfect cup of tea. The very clinical looking set includes devices such as a glass carafe, three temperature bulbs, a tea caddy and a tea filter. 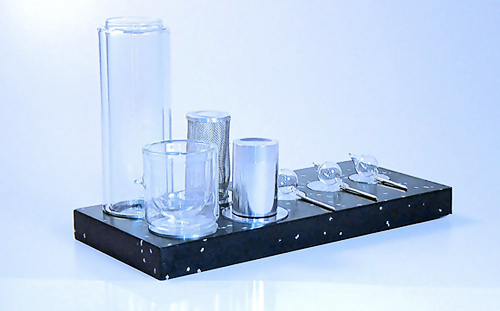 The main feature of this design is usage of the Galileo thermometer to get the correct temperature of brewing water. The three bulbs indicate different temperatures and raise to the top of the glass cylinder when water is ready to be used. Once ready, you place the tea leaves inside the filter and put it into the tube. You wait and admire the water changing color and there it is, your perfect cup. The inspiration for this project was that 64 millions of cups are being brewed on a daily basis, however few of them are prepared with deserved care and attention to achieve the optimum flavor. However, this brings me to the question ‘Is there a perfect cup of tea which can be endlessly executed in the same ritual?’ I agree, tea is usually prepared with little care, in fact, what most people do with tea is sacrilege, but can there be a device which will produce a perfect cup of tea every time. I’ll leave you with that. Enjoy the video. So during a road-trip we stopped at a random gas station on the way to Warsaw. 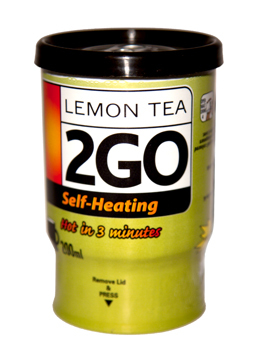 I roamed though the small shop for food and beverage and found this… I read Lemon Tea – Self-heating, no way! The future is now. The appropriate geeky thing to do was to buy it and try it out and most importantly see if it’s any good. I was most interested in the heating process itself. The heating is caused by calcium oxide. The can has two lids, you remove the bottom lid, press in a strange piece of plastic, shake the can and let the magic happen. The process is really quite bizarre when done for the first time and it happens much faster then anticipated. You turn over the can and it starts getting warmer. It goes up to about 40ºC, so not boiling hot, but it’s perfect temperature to start drinking straight away. It keeps heat longer then time needed to consume the beverage. The tea tastes surprisingly good. It looks like those Nestea Iced Teas, brown in color, a bit sweet with that slightly lemony taste. Although it is not a health drink, we got instant lemon tea and black tea extract, some sugar and citric acid here, I could imagine drinking this on the road. When your nose gets close to the can it does however smell a bit like there’s been a chemistry lab going on. I guess you can’t avoid side effects with gadgets like this. Everyone knows, cool things don’t come cheap and neither does this one. The price is the only downside really – just about 2.60 EUR is a bit much for a take-away drink, but it is worth the excitement you should treat yourself to in this jolly holiday season. 2Go tea brought to you by Fast Drinks.